Low in fat, big on flavor! Two food lovers share recipes, all made with simple, natural ingredients. With all the holiday events we have the next few weeks, I know I’ll be enjoying good food and drinks more often than normal. 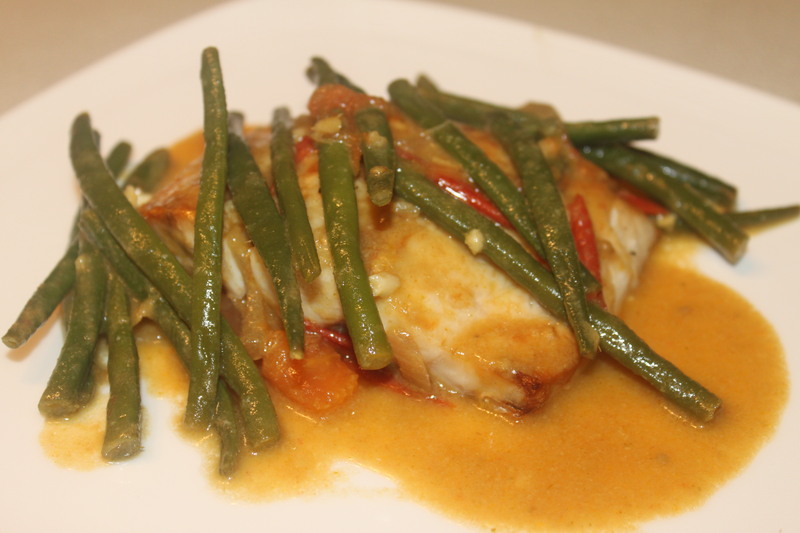 I try to balance out the indulgence by having light meals at home that are also very fast to prepare- this cod recipe meets that criteria. The seasonings are very flavorful, and you don’t need any oil. 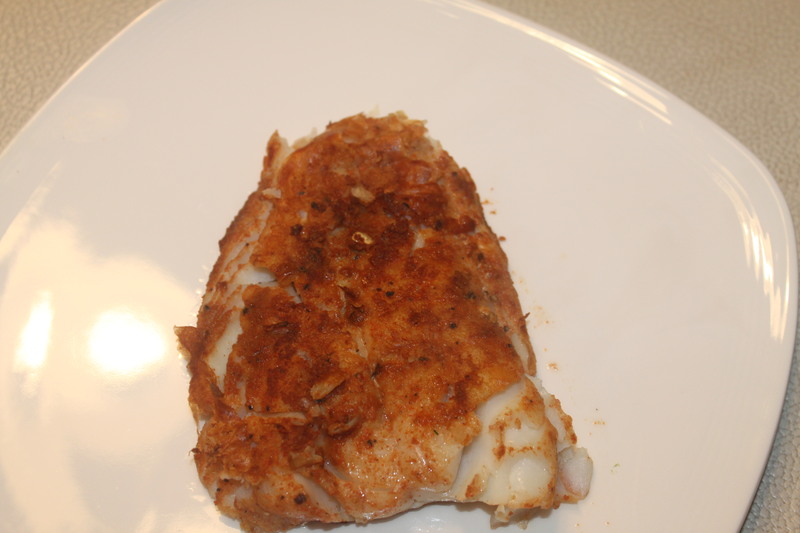 Cod is so low in calories (around 190 for an 8-ounce fillet according to www.calorieking.com) that you can easily have a half-pound serving. 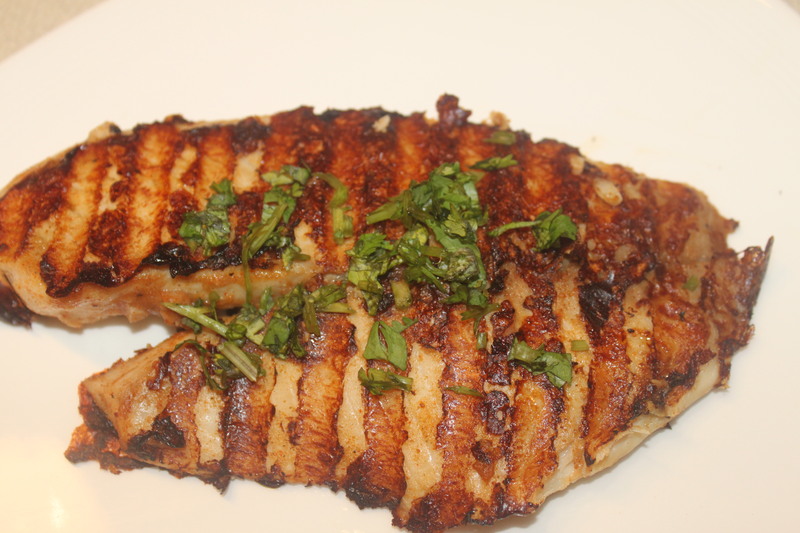 And, since it’s also protein rich, this entree will keep you satistfied and full. Mix all the ingredients together except for the cod to make a paste, and rub all over the fillets. 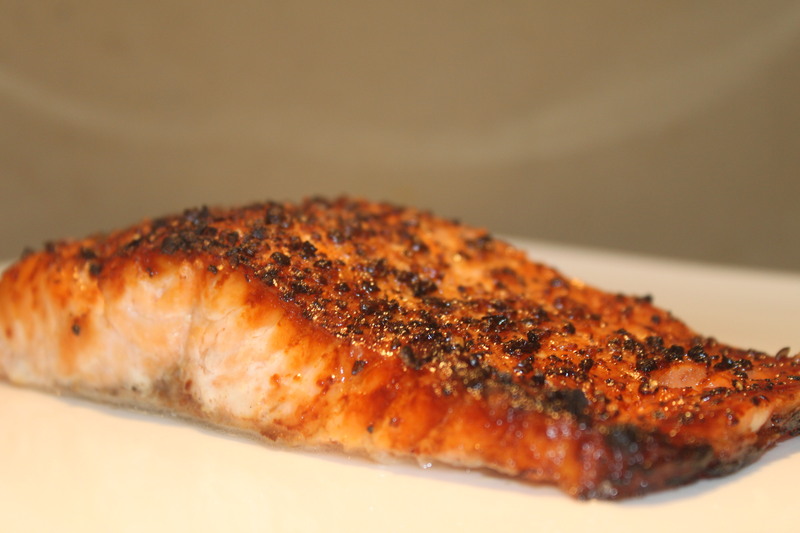 Place fish on foil lined sheet or any oven-proof dish and bake for 5 to 10 minutes. Turn off oven, and turn on broiler on high. Broil until fish is cooked and lightly brown- maybe another 2 minutes. Serve with a big salad and some crispy whole-grain crackers or crusty whole-wheat roll. Place fish on a foil lined tray, season with salt and pepper, and bake until done, about 15 to 20 minutes, depending on thickness of the fish. Cover fish to keep warm while curry cooks. Heat oil in a medium nonstick pan over medium heat. Add onion, and saute 2 minutes. Add garlic, and saute 1 minute. Add tomato, and saute mixture for 2 minutes. Add in green curry paste and coconut milk and blend well. Bring to a gentle boil, add green beans and cook until beans are soft but not mushy- around 5 to 8 minutes. You get your veggies and protein in with this dish so all you need is some brown or jasmine rice, and you’re ready to eat! Whisk all the eggs together with the sea salt and set aside. Place an oven rack on the top setting in the oven (making sure your skillet will fit). 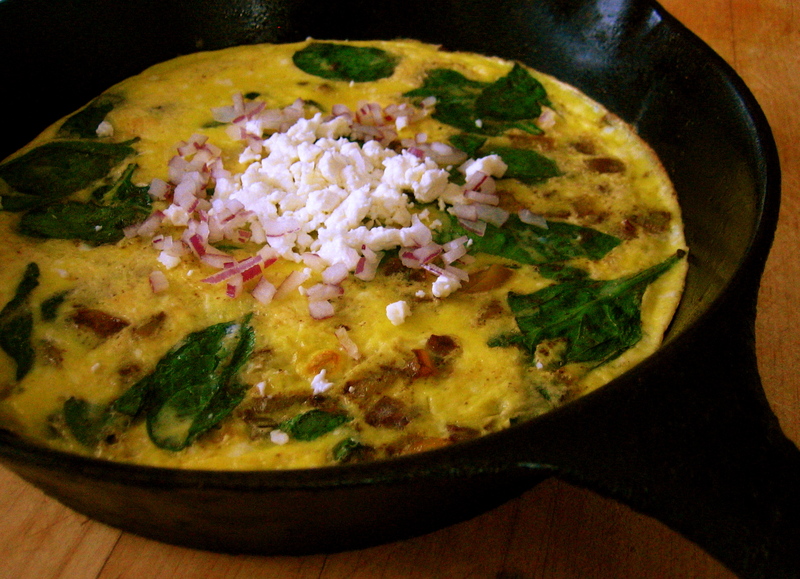 Heat the olive oil over medium heat in a medium sized oven-proof non-stick (or well seasoned cast iron) skillet. Saute the onions and peppers for one minute. Add cumin and oregano and sauté another two minutes. Add spinach leaves and saute for a few seconds or until lightly wilted. Pour egg mixture, covering veggies evenly. Reduce heat to medium-low, cover skillet and let the mixture cook for 3 minutes. Remove cover and place skillet under the broiler. Close oven door and broil for another 2 minutes, or just until the rest of the egg mixture has set. Use an oven mitt to remove skillet from oven. Add garnishes of your choice, slice into wedges, and serve warm. Toasted whole grain bread or fresh seasonal fruit are both good choices for a perfect carbohydrate accompaniment. Heat oil in a medium nonstick pan. Add onion and garlic and saute for 3 minutes or until onion softens. Add tomatoes. Cook for 1 to 2 minutes. Add spices except for cilantro and stir together with tomato and onion mixture. Add 1/4 cup water, and let simmer for 1 to 2 minutes. Add in tofu and season with salt and pepper. Cook for 2 to 3 minutes. Roll this tofu up in a whole-wheat tortilla as a wrap and have some crudite as a side. 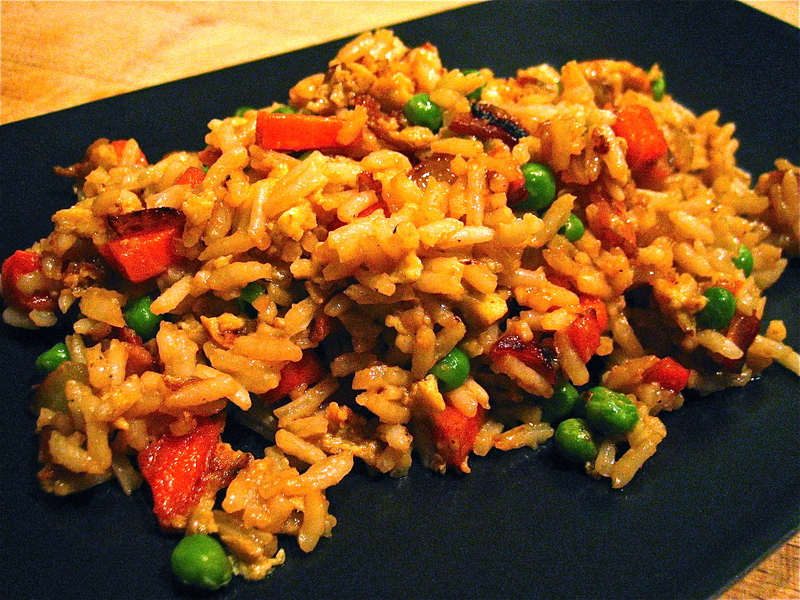 Or, serve over rice and have with any Indian vegetable. Heat a large non-stick (or well seasoned cast iron) skillet over medium heat and add the diced bacon. Stir fry until it begins to brown and the fat renders from the meat. Turn off the heat. Remove bacon pieces to a plate lined with a paper towel to soak up excess fat. Strain off most of the remaining fat drippings from the pan, keeping just enough to stir fry the remaining veggies. Return pan to the heat, add onions and carrots and stir fry until they are getting lightly browned and a bit tender. Add the eggs and sea salt and slowly stir, allowing eggs to “scramble” until well cooked. Add the bacon, the peas, and the rice and combine it all well. Add tamari and hot sauce to taste and serve while hot! A side of sauteed spinach or stir fried cabbage are great side dishes to go with this rice, or a marinated cucumber salad would be great too! Try diced shiitake mushrooms, or diced smokey tempeh strips, also called “fakin bacon, or small diced seitan in place of the bacon, or simply omit the bacon and make a tasty veggie fried rice. Season fish with salt, pepper and lemon juice. Depending on thickness of fish, bake for 5 to 7 minutes. Turn off oven, turn on broiler on high (make sure salmon is on the top rack directly underneath the flame), and broil until fish is cooked- probably another 3 to 5 minutes. Serve over brown rice or alongside a baked white or sweet potato. Lightly sauteed spinach or broccoli work well as vegetables with this meal. Mix together all of the ingredients except fish and cilantro. Add fish and marinate for 30 minutes. Warm a nonstick grill pan or nonstick regular pan over high heat and coat with cooking spray. Lower heat and add fish. Cook for 4 minutes per side- times might vary depending on thickness of fillets. If desired, squeeze with a little lemon juice, and top with cilantro. Try with a warmed whole-wheat pita or a Food for Life Brown Rice Tortilla. The zucchini I posted a few weeks ago is an ideal veggie side. To make the dressing, combine the honey and water in a measuring cup or small bowl. Add remaining ingredients and whisk to combine. Taste and adjust seasonings to your liking. For the salad, toss spinach, cabbage and dressing together in a mixing bowl. Use tongs to divide mixture equally onto two large plates, reserving the remaining dressing which collects in the bottom of the bowl. 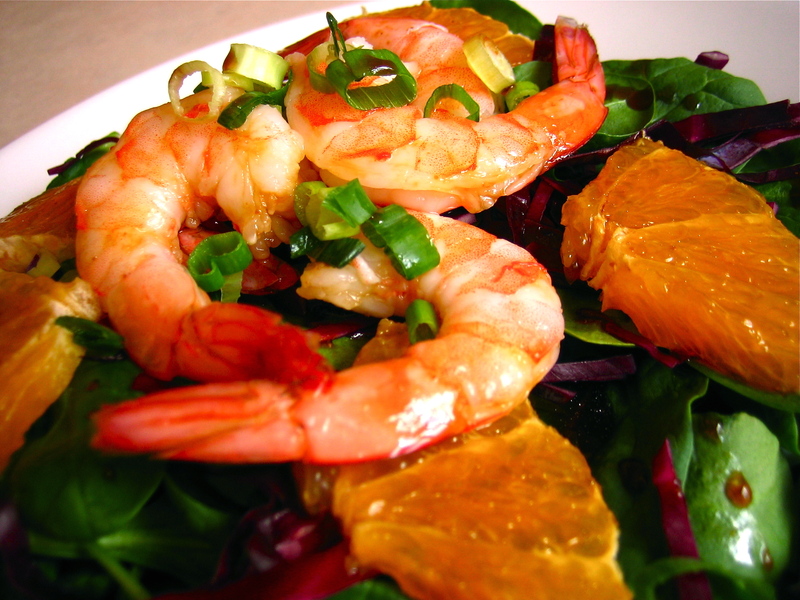 Arrange the oranges and shrimp on top of the salads and garnish with plenty of sliced scallions. Drizzle the remaining dressing over the shrimp and oranges and serve! To make a more robust meal serve a side bowl of brown rice for each portion with a simple miso broth poured into it, garnished with strips of toasted nori seaweed, or more scallions. If you like a spicy-hot salad dressing – add a few dashes of Asian style hot sauce to the mixture. 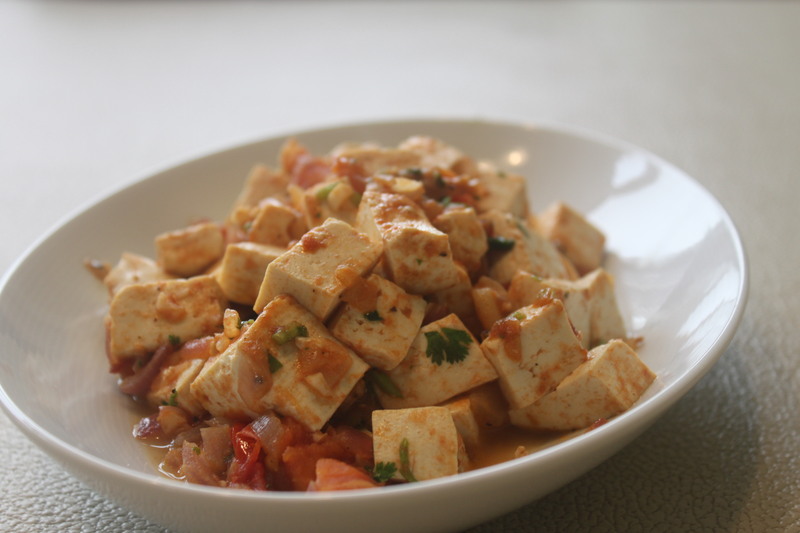 Use cubed tofu in place of the shrimp, or for a special treat try it with a handful of toasted cashews instead! In the meanwhile, heat 1 teaspoon of oil in a medium nonstick pan and saute garlic. Add swiss chard, season with salt and pepper and stir-fry for 3 to 6 minutes or until wilted. Heat another teaspoon of oil in the same pan, add shrimp and cook until done- about 2 to 3 minutes a side depending on size of shrimp. Add swiss chard, pasta and all the other seasonings to the pan, and mix together. This is a self-encompassing meal, but feel free to add a simple lettuce, tomato and onion salad as a side dish. 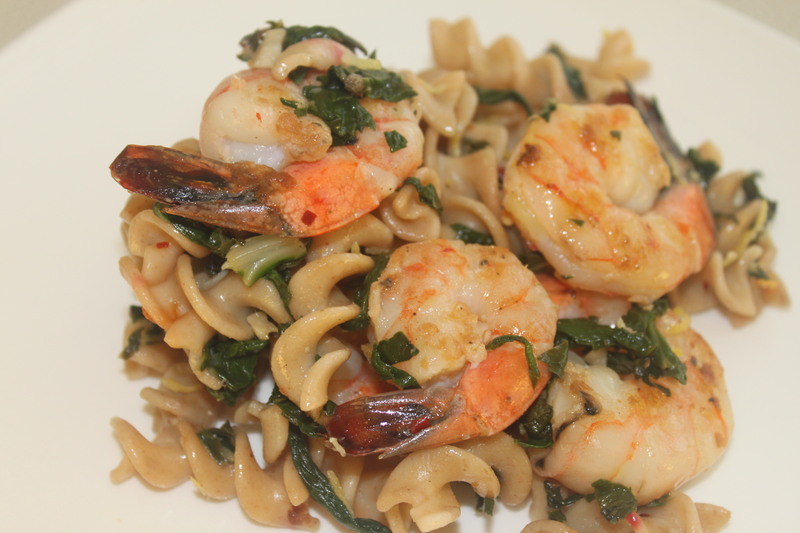 You can use canned or fresh chickpeas or cannellini beans in place of the shrimp. Skip the sauteeing shrimp step, and leave the swiss chard in the pan. Add all the other ingredients including one can of beans and the extra teaspoon of olive oil that you didn’t use to saute the shrimp. Preheat oven to 350F. Put turkey and parsley into a mixing bowl. Make bread crumbs by putting toasted crumbled bread in a food processor fitted with the double blade and pulsing until finely ground. Add onion & garlic cloves and pulse until everything is well combined. Add breadcrumb mixture to the mixing bowl. Put egg and feta into the food processor and mix until feta is broken into very small bits and egg is well blended. Add egg mixture to mixing bowl. Add sea salt & black pepper. Use your hands to combine all ingredients. Lightly wet your hands to roll mixture into 1-inch meatballs and place them all on a baking sheet lined with parchment paper. Bake meatballs for 15 minutes. Heat chicken broth to boiling, add orzo, reduce heat to medium, and cook 7-8 minutes. Add the baked meatballs, lemon juice, oregano, thyme, and granulated garlic. 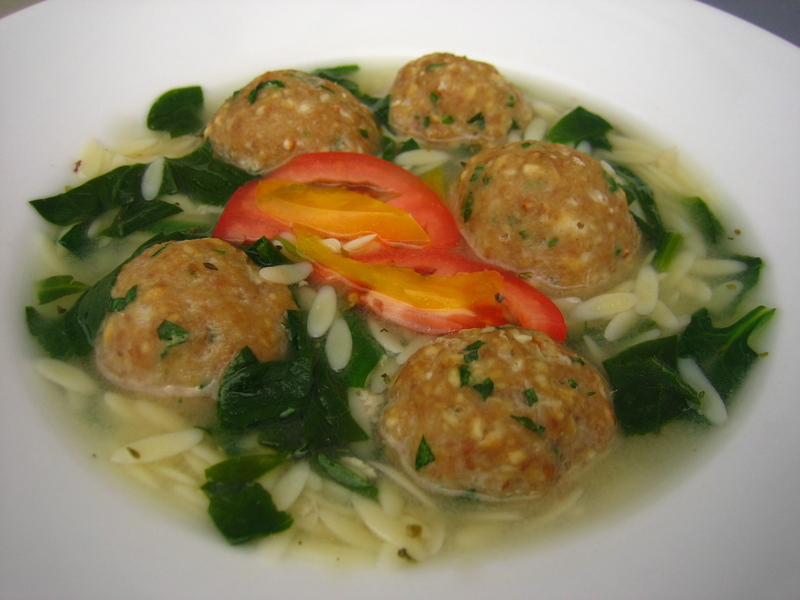 Taste soup and adjust seasonings to your liking (you might like it more lemony, or a little more salty). Roughly chop spinach leaves and add to the pot. Let spinach cook in for one minute and serve immediately, garnished with tomato & pepper slices. Shivani is a freelance journalist. She's the quintessential city girl, living in Manhattan's upper east side with her husband and 21 month old daughter. Susan is the chef and owner of DISH Bistro. She's a country girl at heart, living in upstate New York with her husband (who runs the cafe alongside her), and their fluffy cat, Daisy. We're both incurable foodies! This is where we'll be sharing our latest raves and faves.